This aromatic, cinnamon and cumin scented chickpea dish is warming in the winter and delicous with cous-cous. I made it for our last vegetarian dinner at the Morningstar Center in Bucharest! 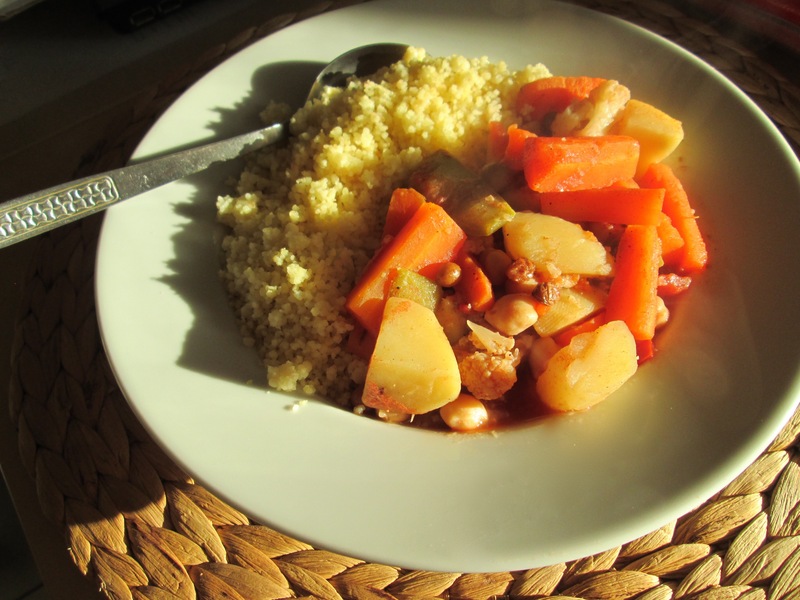 It has the additional advantages of being low fat and vegan, but very hearty and filling. It is also sattvic – a type of vegetarian food that enhances your meditation and yoga practice. I first fell in love with yoga practices in France. I was an exchange student at the time, and we were encouraged to sign up for extracurricular courses in the afternoons. I chose yoga and modern dance. It was the first time I learned to direct my attention within my body and learn to listen and understand its silent language. Although I struggled to understand the directions flowing in graceful French, I was able to follow along with the movements. I became fascinated with my breathing, discovering to my surprise that I didn’t know how to breath correctly. I also learned to use my breathing to release tensions, sink deeper into positions and relax my body consciously. I discovered the limits of my flexibility and witnessed my body gradually loosening, lengthening and becoming stronger. Though I could not remember the long sequences of movements in the class, I had soon memorized a yogic warmup known as the sun salutation and I began to integrate it into my daily morning routine. It soon replaced my need for coffee to wake up – rather with just 5 minutes of the vigorous sun salutation exercise, my entire body felt revitalized and wonderfully stretched and strengthened. It has remained part of my morning routine to this day. When I returned from France, my friends and family had the impression that I had grown taller. I was already twenty, so I doubt that I was still actually growing in height. Rather, I think that as my posture became more aligned, it allowed my spine to lengthen. As I continued practicing, I found that chronic issues I had struggled with throughout my teen years, such as anxiety, chronic digestive issues and symptoms of chronic fatigue that had lingered after a series of illnesses I had had as a teenager, simply evaporated and disappeared. I felt lighter, more dynamic and energized, and the changes were permanent. Most importantly, yoga helped me to tune into my own body and learn to listen to it. I found that even my cravings changed, as I began to feel the need for foods that were lighter, simpler and healthier. Although I had tended to struggle as a child with numerous colds, strep throat, ear infections and flus throughout the winter, after a few months of yoga practice – I noticed that I went through an entire season without falling ill. Indeed, it is now a rare occurence that I catch a cold – despite daily contact with kindergarten children and their runny noses! My eyesight also improved – from a minus 6 to minus 1.75. I attribute this to the practices of “half-bath”, which includes splashing water on the eyes, as well as to the yogic self-massage done at the end of a session which includes many pressure points around the eyes. Most importantly, after a few months of practice, I noticed my mind gradually settling into a more peaceful and harmonious state. When I first began yoga classes, if the teacher proposed a short meditation at the end, it seemed that the restlessness of my mind flitting around like a moth was heightened under the magnifying lens of the quietness in the room. I felt about as far from inner peace as one could possibly be. However, in time, something began to subtly shift within and soon I found myself curious and drawn to introspective practices, and interestingly, my mind was more easily stilled than before. I only discovered later, when studying “Biopsychology” – Shrii Shrii Anandamurtii’s writings on the relationship between glands, cakras and the mind – that indeed, yoga asanas were designed in order to prepare the mind to be still for meditation. At this point, yoga asanas have become such a part of life for me that if for some reason I cannot do them in the morning – it makes me feel just as odd as if I were to skip brushing my teeth. They make me feel alive, fresh, energized and ready to face the day. When I practice in the evening, the days tensions and tiredness melt away and I feel renewed and relaxed. I am so grateful to have encountered yoga asanas. They help me to stay connected with my own body and develop an intuitive understanding from within. As I have learned to inhabit my body more fully, naturally and spontaneously I have found that I am then also able to experience and enjoy life more thoroughly. This is a video / slideshow I made for the 20th Anniversary party of our Familia AMURTEL home last September. It was such a beautiful feeling to be altogether with all of our Familia AMURTEL children – now of course, most of them are already grown-ups! It has been an amazing experience to see them grow and mature – often quite the roller-coaster ride, but overall I am quite proud of each of them! Glad to have been part of the adventure. Hope you will enjoy watching this too! 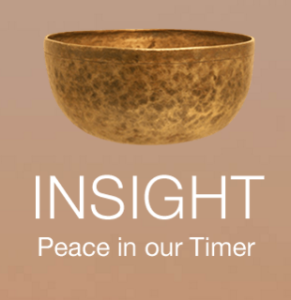 I recently discovered this “Insight Timer” – and it is my current favorite thing! It is free, and you can put it on a smart phone, tablet or use from a browser. I like the subtle tibetan bowl sound as a gentle way to end a meditation session without the rough jolt of other types of alarms. The app also automatically keeps track of your meditation sessions – so that you can record your progress, which can be motivating. It is particularly fun to also find other friends online meditating with you and you can send them encouraging messages…It also shows you how many people are currently using the timer to meditate all around the planet! Fun! De curand am descoperit acest ”Insight Timer”- si a devenit preferatul meu! Este gratuit si il poti instala pe un smart phone, tableta sau sa il folosesti din browser. Imi place sunetul subtil al bolului tibetan, ca un mod delicat de a sfarsi meditatia fara zgomotul brutal produs de alte alarme. Aceasta aplicatie iti urmareste automat sesiunile de meditatie- astfel incat sa iti poti inregistra progresul ceea ce poate fi motivant. Este de asemenea amuzant sa gasim alti prieteni online meditand cu tine si le poti trimite mesaje de incurajare…De asemenea poti vedea cati oameni de pe planeta folosesc in acelasi timp timerul pentru a medita. Distreaza-te! Sper sa te vad acolo! I was invited to Stefan Pusca’s show “Dialogues between the Heart and Soul” on the Romanian TV6 channel – and as I was talking about yoga and kaoshikii, the format of the show is to always include a video clip – so I did a re-edit of the “Kaoshikii around the world” video to fit the 4 minute requirement, and so that we could have some Romanian representation within it! My yoga students loved the video – but were disappointed that they hadn’t had the chance to participate in the project – so now was the opportunity! Hopefully we can redo it in the summer in some more scenic areas of the country – I would like to do it the mountain villages…. On my recent trip to India, I also visited the Ananda Marga Wellness Center in the rural countryside of Ananda Nagar. Dada Dharmavedananda, who runs the project, discovered on the last day of our brief stay that I had video equipment with me – and so we quickly organized a documentation of this new center. It was quite an adventure and the whole team worked very efficiently together. It was such a heavenly relaxing treat to spend time exercising in nature, taking yogic sun bath treatments, fasting and eating simply as well as doing yoga and meditation together. It is definitely quite far off the beaten track, but worth the visit. 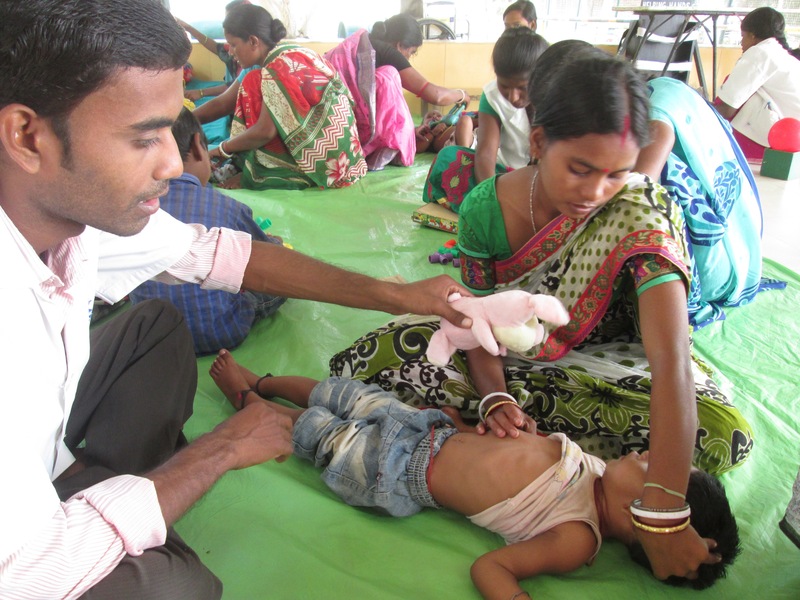 The multidisciplinary team of doctors at the clinic use a combination of acupuncture, physiotherapy, herbal medicine and homeopathy to treat children with cerebral palsy. The results are quite breathtaking. In Romania, one of our kindergartens integrates children with cerebral palsy and over the years, I have seen how their incredibly dedicated parents were always trying out new therapies in the hopes of improvement, which was often quite slight and difficult to determine. However, in many cases, if the child is treated early enough before the onset of contractures and the resulting physiological deformations, the results are quite visible, as you will observe in the video.